Jan 5th: This is not a full review of the Yi 2.7K camera, but rather our thoughts based on the research we did and our experience after testing 50+ cameras. We will update this article in the future after purchasing the camera and testing it. Our opinion may change. After research, we think the Yi 2.7K Ultra Dash Cam does not give enough value for its $100 asking price. It’s not enough that only the video quality and stealthiness have improved over the $50 2016 Yi Dash Cam we previously reviewed and recommended. The Yi 2.7K still uses lithium-ion batteries and has heat-related focus issues which make it a poor choice for warmer environments. If you live somewhere warmer, consider the Viofo A119V2 which offers about the same video quality, but more reliable because it uses a capacitor. You can read our full review on the A119. The Yi 2.7K is solidly built and equipped with a dual-core A17 and A7 processors. That ensures smooth performance and increase in video quality, which leads us to the main selling point of the Yi Ultra dash cam – the 2.7K video quality. The highest resolution video is recorded at 21Mbits /sec, but there is no option of adjusting video quality besides changing the resolution. The Yi Ultra dash cam also has a more discreet design than it’s predecessor – the Yi dash cam, mostly because the manufacturer has opted to use darker paint instead of silvery finish on the Yi. 2.7 inch LCD screen is great for video playback and camera also has four buttons for easy customization and simple camera use. User interface and menus are intuitive and friendly for English users. That is better than the Yi where at first, the menus were only in Chinese. By navigating through the menu, you can change some general settings like date and time as well as set up audio, turn on voice commands and other settings. Recording at the highest resolution with the provided 16GB SD card will give you around 90 minutes of footage. 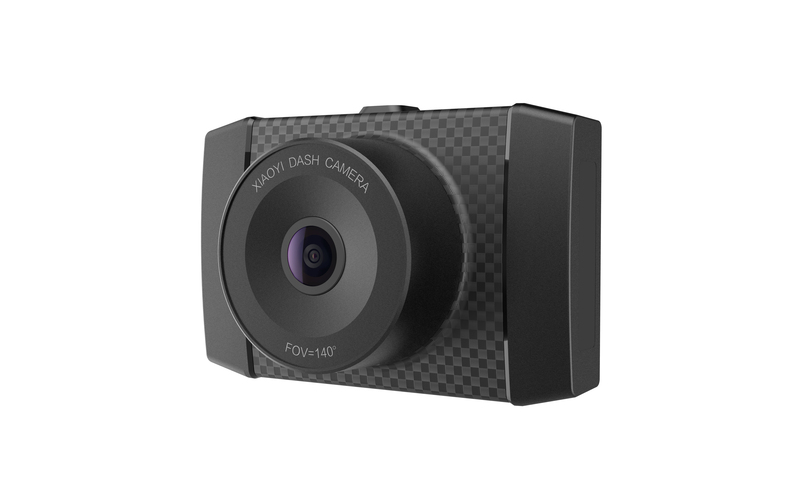 We recommend you to get a proper SD card for your dash camera as it is essential to keep your camera working at all times. Some packages have included a 16GB Sandisk Ultra card while some have included Toshiba SD cards. We don’t need to remind you how bad Sandisk Ultra SD card is when used in dash cameras so make sure to order a proper SD card – Sandisk or Transcend High Endurance SD cards. To find out more about what SD cards we suggest and what we think about possible alternatives, please check our SD card guide. When recorded at the highest possible resolution of 1520p @ 30fps, the video quality is sharp. The image is clear, and you can make out details pretty easily even on a sunny day. The video quality is not quite what you would expect from a 2.7K camera which might be a video compression problem. The Yi 2.7K appears to have a moderate improvement over the $50 1296P Yi we tested a year ago and matches the $100 Viofo A119 we have praised in past reviews. Some people may prefer to use the 1080p resolution @ 60fps, but we don’t suggest to use this resolution as it is too overexposed and it might blow out some details in your image. Night video quality is very good, approaching the best we’ve seen. The dynamic range is excellent, and you can make out details as much as possible, and there seems to be no artificially boosted low-light footage which is the case in some other dash cameras. The Yi’s voice command functionality stands out to most customers. It’s not as exciting because you can only do two commands. You can start an emergency recording by saying “Yi begin recording” or take photos by saying “Yi take a photo.” You can also do the same actions by using a button. It can get very tricky though. The camera has trouble picking up your voice commands when driving because of the noise inside your cabin. After you’ve started emergency recording, a 10-second piece of video will be added to the file that was being recorded at the moment, and after the loop, it will be put in a separate place. It’s a bit disappointing that they didn’t work in some other voice commands to make this feature more useful though. The WiFi works fast and is a great addition to this dash cam. You can switch it ON and OFF based on your preference. If you decide to stream your video, the camera will create two video files. One of those files will be a full resolution file while the streamable file will be a bit smaller. After streaming, you can transfer the full resolution video file to your phone. The WIFi password is 1234567890. It’s one of the things that’s missing in the camera’s manual and can be seen in settings when you check the firmware of your camera. It’s sad that the password isn’t written in a more visible place. The use of a battery in this camera raises concerns as batteries tend to swell in warm temperatures. It’s a fairly new camera, so there aren’t many reports about its reliability. Similar to the Yi though, it loses focus in warm weather which has been a significant concern for a lot of users. Otherwise, there are no well known and persisting issues with this camera. The reviews on this dash cam are overall very positive. Most people are happy with camera’s performance and amazing video quality. However, there are some concerns about this camera performing in hot weather because it has a lithium ion battery inside. LiON batteries can swell and are more likely than capacitors to cause problems and break your camera. People have also been complaining about camera crashing and restarting, but that might be an issue of a bad SD card, likely due to the one that’s included in the package.